For the DIY brides, or even those looking to cut a few wedding costs from an already-outrageous bill, doing a few things herself isn’t completely out of the question. From bouquets and centerpieces to the nameplates and table settings, the possibilities are positively endless. With the help of craft stores and DIY videos, brides are relying less on wedding planners and more on the help of their friends for a night of crafting that can result in beautiful pieces to show off at the wedding. If flower arrangements aren’t your thing, the invitations are a great place to start your DIY project. With a little practice and a few helpful tips, you can create beautiful wedding invitations you’ll be proud to send to your guests for your big day. Start early and give yourself a little bit of time to practice making the cards. Taking on wedding invitations is a large task on its own, so make sure that you are comfortable with crafting before adding this to your plate. If you’ve never indulged in paper crafting before, you may need a few trial and errors before perfecting your dream invitation, or ask a few friends who have experience to help you. It might be fun to even have a card making party! Browse the web or your local book store for fresh or classic invitations for a little bit of inspiration to create your own. Craft books are the perfect source for step by step instructions, but combine a few of your favorite looks for a look that is completely your own. Good places to begin are sources such as craft store sites and popular brands. David Tutera, of My Fair Wedding, has an entire line of wedding invitation crafts. His videos and a peek at his line can be found here. Joann Fabrics offers a gallery of David Tutera cards, this is a great start to discovering new ideas and trends. The gallery can be found here. Working your wedding theme and colors into the invitation is a lovely way to give your guests a preview of your big day. Start by selecting colors close to your color scheme, or if you prefer the classic white or eggshell invitations, consider adding small elements such as lace or pearls similar to those in your dress. Also, think about the size of the invitation cards. While this may seem like a small detail, long messages on small invitations tend to look crowded and messy. 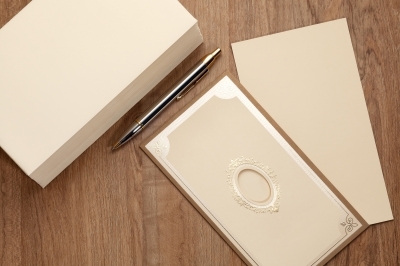 Keep the length of your invitation text in mind when selecting the card stock. These are simple to print out from your computer, or if you have the time, make them yourself to match your invitation. You will want to include these with the invitations, because it will give you a headcount of how many friends and family members to expect. If you are offering dinner options, remember to include those on the RSVP card so that your guests can choose their entrees for your big day. This is also a great opportunity to ask your non-married guests if they will be bringing a guest, so that you can plan accordingly! If your wedding is on the larger side, factor in the cost of materials to make sure that it won’t actually cost more to make these invitations yourself. If this is the case, crafting the wedding party bouquets might be a better alternative for cost-cutting. If you do decide to go the way of invitations, make sure to check out whole-sale offers for your supplies! Take advantage of newspaper ads, mail flyers, and mobile apps. Joann craft stores and Michaels offer coupons on their websites, along with easy-to-access coupons and deals on their mobile apps. *Tip: Michaels often offers special deals on Sunday afternoon. These deals vary in type, though they can include anywhere from 15% to 40% off your entire purchase, sale items included. Make Sunday afternoon your set shopping date if these deals are offered. You can find out that day’s deals through their mobile app on Sunday morning.